Without the support from the following Cleveland companies we would not have been able to continue doing this festival. Support the hell out of these companies, because they support the hell out of ACC. Jakprints has teamed up as an official print sponsor of the Accidental Comedy Festival for the second year running. 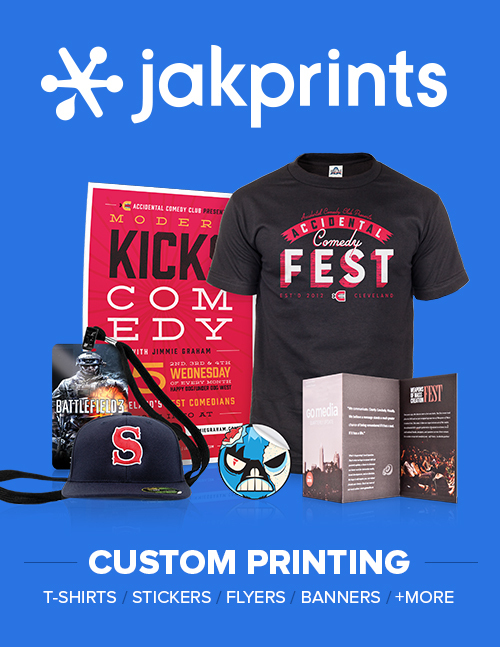 Since 1999, Jakprints has focused on supporting music and art in CLE by printing Business Cards, Postcards, T-Shirts, Snapbacks, Banners, Giclées and Stickers. Plus, they plant one tree with every order. Their catalog of products has enabled ACF to put out professional grade materials to the public. If you need any print work done, email Jimmie Graham at jgraham@jakprints.com. He will take care of you for being a part of the ACF support group! The Cleveland Hostel has been a hospitality partner for ACF for the last 3 years, lodging artists from around the country in one of Cleveland's best neighborhoods. If you haven't been to the hostel, check it out next time you're in OHC. It's a great, affordable and very well run space that is welcoming to travelers from all over the world. BOCA LOCA BURRITO FACTORY is sponsoring ACF for the first time this year and we couldn't be more excited. One of Cleveland's most popular food trucks has been growing exponentially since they started slanging burritos to the greater Cleveland area. They're opening a physical location in BEREA, but their beloved food truck will be on hand FRIDAY SEPTEMBER 11 and SUNDAY SEPTEMBER 13 providing delicious eats for artists & audience alike! Come hungry, leave happy. This is the 1st year Burning River Sound has partnered with ACF. The DJ company offers a variety of services, and will be providing the karaoke fun for the basement lounge on FRIDAY SEPTEMBER 11 and SATURDAY SEPTEMBER 12. Loosen up those vocal chords, it's going to be fun down there. Brick and Barrel is run by three guys who are excited about making quality beer and wine in Cleveland. Their brewhouse is American- made and our ingredients are of the highest quality. When you drink their beer, you will know it was made with sincere dedication. Brick and Barrel have a genuine love for the local beer and comedy scene, and equally for our home city of Cleveland. Their aim is to contribute to the growth and evolution of them all. By creating exceptional wines and craft beers, their giving the local community something to be proud of. The Keep It Local Cleveland Project was started with the hope of creating awareness in Cleveland about our local businesses. Our mission is very simple, we connect local businesses with local people. We do this by helping you find and identify local businesses, and give you deals for trying them out. Local business is the backbone of the local economy and supporting them directly supports the community around them. Find verified local businesses here.